Zakopane’s charm derives from its location at the foot of the Tatra Mountains. To enjoy it at its best you will firstly undertake a ride by cable car to the top of one of the most beautiful places in the Tatras: Mt Kasprowy (1987 m). Here you will have the opportunity to admire the breathtaking scenery while standing right on the state border with Slovakia. Afterwards you will pay a visit to the most famous wooden building in Zakopane – Villa Atma. Now it houses the Museum of Karol Szymanowski, one of the greatest composers of the twentieth century, and where you will be able to enjoy this beautiful specimen of traditional Zakopane architecture and see objects from its history. Later on you will visit the large wooden chapel located in the settlement of Jaszczurowka, which constitutes an outstanding example of Podhale region sacral architecture. The chapel was built by Witkiewicz and attracts visitors with its splendid wooden interior. Another exceptional place is the famous cemetery of “Na Peksowym Brzysku”, which has about 250 graves of celebrities of Polish culture and tourism. 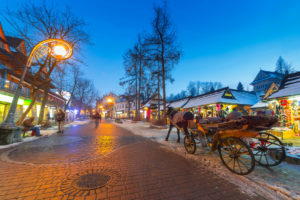 The last stop of the tour, Krupowki Street, is one of the best-known Polish promenades and as such it is the liveliest area in Zakopane. One can find a multitude of architectural styles in the vicinity of the promenade and absorb the living highlander folklore.